For the uninitiated, Phil Mickelson made some pretty cryptic comments on Sunday after he finished his final round at the Humana Challenge. Parts of the transcript, courtesy of Scott Michaux, are posted below. Q. When you’re asked about Stricker’s semi‑retirement, with the political situation the last couple months, blah, blah, blah, what did you mean by that? Do you find it an unsettling time in a way? PHIL MICKELSON: I’m not sure. 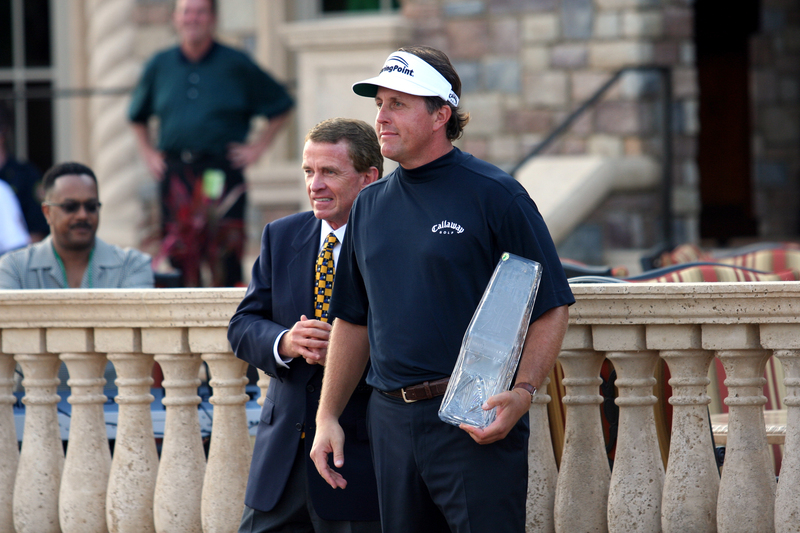 PHIL MICKELSON: I’m not sure what exactly, you know, I’m going to do yet. I’ll probably talk about it more in depth next week. I’m not going to jump the gun, but there are going to be some. There are going to be some drastic changes for me because I happen to be in that zone that has been targeted both federally and by the state and, you know, it doesn’t work for me right now. So I’m going to have to make some changes. Q. So why do you say next week? What is going to happen so drastic next week? PHIL MICKELSON: No, but I’ll probably be in the media center and I’ll probably be a little more open to it because San Diego is where a lot more things, it’s where I live, it’s where the Padre thing was a possibility, and it’s where my family is. And it just seems like a better fit than right here off of 18 on Palm Springs. Q. Is it a stance that you are taking because on the one hand, you’ve made a lot of money, and no matter how much they take out, you are left with a lot of money? PHIL MICKELSON: Yeah. I’ll probably go into it more next year or next week. But if you add up, if you add up all the federal and you look at the disability and the unemployment and the Social Security and the state, my tax rate’s 62, 63 percent. So I’ve got to make some decisions on what I’m going to do. Now, lets get one thing out of the way: Mickelson isn’t retiring, as some people have suggested is a possibility. As upset as he may be about the impending changes to the already high tax laws in California, he’s not going to give up playing the game that allowed him to earn over $45 million in 2012. Mickelson was asked about changing some things in 2013 and about Steve Stricker, who announced earlier this year that he was severely reducing his schedule, going down to about ten events per season. Of course, Stricker is doing this because he wants to spend more time with his family and his foundation, and even though he’s winding down, Stricker isn’t retiring either. Now, the part of the story that’s drawing attention is Mickelson’s complaint about how much he’s being taxed. The reason for that is simple: How could anyone complain about taxes when you made north of $45 million in one year? That’s been a common refrain on Twitter and in the articles I’ve read so far, and I get it. People who are struggling to get by don’t want to hear about the problems of someone who pulled in eight figures last year. According to Golf Digest, Mickelson has earned over $400 million in his career on the PGA Tour when you combine tournament earnings and endorsements. Mickelson isn’t struggling for money, and no one should feel sorry for him. His comments come across as tone deaf, completely oblivious to the fact that he has spent more money than most people could ever dream of having, but I understand where he’s coming from. I’m not an expert on the American tax system, but Rex Hoggard of Golf Channel talked with a tax attorney from San Diego who claimed that Mickelson’s numbers are a little off. The attorney figures that Mickelson will probably pay about 53%, not 63%, which is still obviously a significant amount of money. He’s obviously had a lot of success on and off the course over the years, and he’s entitled to as much money as people are willing to pay him. Instead of retiring, the simple solution seems to be that Mickelson should move to a state that collects less in tax, say Florida or Texas. When asked about it today in his press conference, Tiger Woods suggested that the high amount of taxes in the state of California was part of the reason he moved to Florida in 1996. I absolutely love what I do. I love and appreciate the game of golf and the people who surround it. I’m as motivated as I’ve ever been to work on my game, to compete and to win championships. Finances and taxes are a personal matter and I should not have made my opinions on them public. I apologize to those I have upset or insulted and assure you I intend to not let it happen again. Obviously Mickelson realizes that he shouldn’t have said anything, but we also know that he fully believes in what he said in the first place. Mickelson has always been honest with the media over the years, and has been an entertaining interview, but I have to think he’ll be a little more careful with what he says in the future.